Imagine you’re back in an awesome city you’ve previously visited. Maybe it’s San Francisco – Union Square, Fisherman’s Wharf, North Beach. Maybe it’s Chicago – Magnificent Mile, Millenium Park, The Loop. Or maybe it’s New York City – Central Park, Times Square, SoHo. When you planned your first visit to whichever city you’re thinking back to, you probably put a lot of thought and effort into choosing a high-quality hotel that had what you considered to be a convenient, central location. However, if you were to re-visit that city, do you really think you’d be quite so picky with the location? After all, most tourist-friendly cities provide (to one degree or another) tourist-friendly public transportation. And most of the attractions you’d want to visit are probably serviced by that same public transportation. And most of those high-quality hotels are located near that same public transportation, too. Right? If you’re generally nodding your head in some form of agreement, good. Because, if you follow that logic and thinking, you’ll eventually come to realize that I’m onto something good and wonderful when I say that using Priceline to name your own price for a hotel is the way to book your hotel. However, I realize that the thought of bidding on hotel accomodations may give you a queasy feeling in your tum-tum. If so (regardless, actually), read on and I’ll explain away your fear and/or doubt. When you name your own price for a hotel on Priceline, you’re essentially bidding for a hotel room. Except, in this bidding, the auction is on-going and you don’t know exactly which room or even hotel you might win. But, like other bidding situations, there are no refunds. When you place your bid, you give Priceline your credit card info and, should you win, they automatically charge you for the room. If you don’t like the hotel you end up in, and yet Priceline complied with the criteria you selected, too bad. It’s yours. And that’s it. You can’t specify the number of beds in the room. You can’t specify the floor you are on. The can’t specify shuttle service. Or gym facilities. Or free parking. After you make a winning bid and Priceline tells you where they booked you, you can call up the hotel and make special requests. But, there are no guarantees the hotel can or will be able to comply with them – and you can’t blame Priceline if they don’t. If you absolutely need some detail guaranteed outside of the DATES, QUALITY, and ZONE, don’t use Priceline’s name your own price feature. With that said, if you read through the instructions and warnings Priceline provides, if you carefully think through your selections, and if Priceline does their job properly, you should be happy with where Priceline books you. I said “should”. But, with a little know-how and understanding, we can turn that “should” into a “will” – as in “you will be happy with where Priceline books you”. Let’s do some learning, shall we? Let’s work through an example bid. 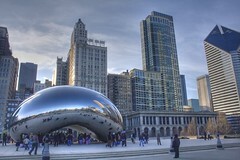 Suppose you want to visit Chicago from May 15th through May 18th (checking in and out on said DATES). You want to stay at a high-quality hotel along the Magnificent Mile. Go to Priceline and click the “hotels” tab. Click the link or button that says “name your own price”. When you are presented with the “name your own price” form, enter your destination and DATES. Submit the form. Start with the ZONE selection. Every available hotel in a city for which you can name your own price is categorized into one of many ZONES, based on geography. Study the line-delineated geographical boundaries of each ZONE. This is very important! Don’t place a lot of faith in how Priceline labels each ZONE. The important thing is how Priceline depicts their boundaries. For Chicago, we want to stay along the Magnificent Mile. Looking through the boundaries of each ZONE, we come to realize that the one we want is “North Michigan Ave – River North Area”. When you select (or check) the “North Michigan Ave – River North Area” ZONE, look down the page at the QUALITY levels section. You’ll notice that one, some, or all of the QUALITY levels become active. Since we want a high-quality hotel room, our minimum QUALITY level is 4-star (maybe 3 1/2-star). And we can see that the “North Michigan Ave – River North Area” ZONE contains one or more hotels with these QUALITY levels. Select the 4-star QUALITY level. Until you get a few successful Priceline bids and subsequent hotel stays under your belt, stick with 4-star hotels. Now we move onto the BID entry box. The BID is the amount you are willing to pay per room, per night, not including taxes and fees and typical crap like that. Priceline will give you some guidance regarding the median retail price. Ignore it. Let’s go with a BID of $50 and submit. Priceline will probably warn you that you are bidding too low. Reaffirm your $50 BID and continue. There’s a lot that goes into deciding on your initial BID, but, for now, just use Priceline’s winning bid lookup tool as your reference point. Bid less than the amounts shown in the lookup tool. For a more thorough treatment on the subject, take a look at my post about determining how much to bid. Read through and understand the guidelines Priceline displays. Just because I’m explaining things to you does not mean you shouldn’t understand Priceline’s rules. Double-check your DATES, QUALITY, and ZONE selections and also your BID. Continue and supply your credit card information. Like I said before, if you win, your card will be billed immediately. If you don’t win, you won’t be billed a cent. Submit your final confirmation and wait anxiously (typically less than a minute) for your bid to be… refused. 😛 That’s fine. If you did everything right, your first bid should fail. I know that sounds odd, but it’s true. Generally speaking, if your first bid is accepted, you started too high. You can change one or more of your three selection criteria (DATES, ZONE, and/or QUALITY) and bid again immediately. You can keep your same three selection criteria (DATES, ZONE, and/or QUALITY) and bid again in 24 hours. If you try to submit the same BID amount for the same three selection criteria within 24 hours of your original bid, Priceline will reject it as a duplicate request. Don’t worry, we’re on the same page. Keep reading. If you’re anything like me, by the time you’re looking for hotel rooms, you’ve already gotten a pretty firm idea of your check-in and check-out DATES and you aren’t really willing to mess around with them. So, during a normal bid process, we’re not gonna’ change our DATES. As far as QUALITY goes, I’m not all too demanding with the amenities, but I want my room to be clean and comfortable and quiet. Unfortunately, and sadly enough, in order to kind of guarantee you get all that, you have to stay around the 4-star (maybe 3 1/2-star) QUALITY range. So, while it’s more flexible than the DATES, during a normal bid process, we’re not gonna’ change the QUALITY level either. Priceline will NOT stick you in a hotel that is lower than your minimum QUALITY level. Not every ZONE contains hotels spanning all QUALITY levels. But, Priceline will let you include an unmatchable ZONE in your selection criteria, anyway. Huh? Yeah, I know. Let’s continue with our example bid to illustrate. So, Priceline wants us to re-bid. If you are sitting on the your-bid-was-refused-try-again-now page, this is NOT where you want to be. I repeat, DO NOT re-bid from the “Try Again Right Now” page. Return to the Priceline home page and click the link or button that says “name your own price”. You should be presented with a form with your destination and DATES already filled-in. Submit the form. The “Try Again Right Now” page will not let you deselect the ZONE you just bid on. Unchecking and checking each ZONE one at a time is a critical part of making an informed re-bid. You should find yourself back on the main bidding page. Focus your attention on the ZONE section. As of this writing, Priceline divides Chicago up into 11 ZONES, one of which is our target “North Michigan Ave – River North Area” ZONE. Select (or check) the “North Michigan Ave – River North Area” ZONE and you’ll see one or more QUALITY levels become active, including our target 4-star QUALITY level (just like before). Now, deselect (or uncheck) the “North Michigan Ave – River North Area” ZONE. Instead, select (or check) the “Franklin Park Area” ZONE and note which QUALITY levels become active. Hmm, the “Franklin Park Area” ZONE does not contain any 4-star or 5-star QUALITY level hotels. Jackpot! We’re ready to re-bid. Add the “Franklin Park Area” ZONE to our original “North Michigan Ave – River North Area” ZONE selection. Increase our BID by $5. OK, now take a minute and think. Why are we doing this? Why are we including the “Franklin Park Area” ZONE in our bid when we have absolutely no desire to stay in the “Franklin Park Area” ZONE? Answer: Because you have to modify one or more of your three selection criteria (DATES, ZONE, and/or QUALITY). Otherwise, you have to wait 24 hours to re-bid. OK, that makes sense. But, think a little more. Why won’t we get stuck with a 2-star hotel in the “Franklin Park Area” ZONE? Answer: Priceline will NOT stick you in a hotel that is lower than your minimum QUALITY level, which you are going to keep at the 4-star QUALITY level. However, Priceline won’t hesitate to award you a hotel that is higher than your minimum QUALITY level. That’s why we’re looking for ZONES that do not contain any 4-star or 5-star QUALITY level hotels. Another thing – if, when selecting a zone, a “Resorts” option activates in the QUALITY level area, do NOT include that ZONE in your bid unless you are OK with staying at a resort. Resorts upend the normal star level pecking order and can be awarded in lieu of a 4-star, or even 5-star QUALITY level hotel. OK, yeah! That’s cool. But, there’s one more wrinkle. We changed the selection criteria. Why are we increasing the BID amount? Answer: We’re essentially bidding on the same pool of available hotel rooms we did just a few minutes ago and none of them were available at that BID. Let me expand on that. What we are doing is altering our three selection criteria (to keep Priceline happy) by adding in an unmatchable zone (to keep us happy). Because the “Franklin Park Area” ZONE does not have any hotels that match our minimum 4-star QUALITY level, we have not expanded in any way the pool of available hotel rooms on which we are bidding. As such, we need to increase our BID to have any hope of it being accepted. So, let’s get on with it. Select (or check) both the “North Michigan Ave – River North Area” ZONE and the “Franklin Park Area” ZONE. Select the 4-star QUALITY level. Enter a BID of $55 ($5 more than our original BID) and submit. Reaffirm your $55 BID (if prompted) and continue. Double-check your DATES, QUALITY, and ZONE selections and your BID one last time. Supply your payment information. As before, if you win, your card will be billed immediately. If don’t win, you won’t be billed a cent. Submit your final confirmation and wait. If you win, awesome! If you don’t, no biggie. We can go right back and bid again using the same strategy, but adding in another unmatchable zone. Let’s imagine our second bid was refused and make a third bid. Again, DO NOT re-bid from the “Try Again Right Now” page. Return to the Priceline home and start again from there, as explained earlier. You should find yourself back on the main bidding page. Add the “Hyde Park” ZONE to our “North Michigan Ave – River North Area” and “Franklin Park Area” ZONE selections. Are you seeing the pattern? With each re-bid, all we do is toss an additional unmatchable ZONE into the mix and add $5 to our BID amount. So, do that. Select (or check) the three ZONES. Select the 4-star QUALITY level. Enter a BID of $60 ($5 more than our previous BID) and submit. Reaffirm, double-check, yada-yada. Submit your final confirmation and wait. If your bid is refused a third time, add the “Lincoln Park Area” ZONE to the mix and BID $65. If you are refused a fourth time, add the “Midway Airport North” ZONE and BID $70. Hopefully, with one of those bids, you’ll get back those magical words “Your Bid Has Been Accepted”! Ahhh. However, sometimes, despite all of our strategizing, we max-out on unmatchable ZONES and come away with nothing. What do we do then? It depends on how urgently you need the hotel booked. If you don’t have much time to waste, go to bed, wait 24 hours, and start over with a bid for a 4-star QUALITY level hotel in the “North Michigan Ave – River North Area” ZONE. But, instead of starting with a $50 BID amount, pick-up where you left off and start with a $75 BID. Work your way through the unmatchable ZONES again (double-checking that they are all STILL unmatchable ZONES) and you’re bound to hit. If, on the other hand, you have some breathing room, you might want to wait until 3 or 4 weeks out from your expected check-in date to try again. The room inventory made available to Priceline (and, therefore, you) changes all the time. Consequently, so do the accepted bids. You can start with the same starting bid as before or raise it some to improve your odds of winning. At some point, your bid will be accepted. And you know what you’ll end up with? for pretty much the lowest price possible. In my previous post, I outlined the major reasons why people stress so hard about finding a hotel. So, does using this method to name your own price for a hotel on Priceline address these three reasons? “Accomodations can be pricey and nobody wants to overpay.” -> You’ll pay a good deal less than any publicly-available price for a 4-star or 5-star hotel. “The location can make or break a vacation.” -> You’ll get a hotel right where you want. “Nobody wants to end up in a dirty, smelly, and/or loud room.” -> You’ll get a 4 star hotel, with the standards of quality that entails. If that isn’t good enough for you, bid on 5-star hotels. Again, does using this method to bid on hotels through Priceline get you want you want? I believe so. Mind you, I’m not making any guarantees. As always, buyer beware. But, I believe that using this method will land you the best POSSIBLE deals on hotel rooms. Of course, sometimes you might unknowingly find yourself shooting for the impossible. And there are some locations/situations for which Priceline just doesn’t work very well. I’ll cover them (and alternatives) in a future post. But, the information I’ve provided here should be enough to get you going. Update: Here’s my post about when NOT to use Priceline to bid for a hotel room. So, does this give you enough information to convince you to give bidding for hotels on Priceline a try? Have you tried this method and had success? Or non-success? Let me know in the comments. You’re welcome, stav. My pleasure. Terrific guide, thanks for putting it out there! I went from knowing nothing about priceline to feeling like I can use it very confidently in about 30 minutes. That makes my day, Joe. Thanks! “Unmatchable Zone”- Perfect phrase. In all my PL tips reading, I have never found such a succinct phrase to illustrate the rebid concept. Now I just stay cool and think that when my initial bid fails, I have 4 UZs in my pocket to work with. Thanks for the kind words, Ja. I’ve been using Priceline to get a River North hotel for years and have been going right to between $90-$130 to bid. I will definitely use your strategy for my upcoming trip in July. Thanks for the input, Corinne. Myself, I haven’t used NYOP for a few years. Instead, we’ve been using airbnb. But, the financial advantages of going the airbnb route are starting to diminish. I’ve always assumed I could go back to NYOP for a deal, if necessary. You now have me doubting that, though. Thanks. Next post: How Do You Know How Much To Bid For Hotels On Priceline?